Last Friday, the king and queen of the today’s food world came for lunch. 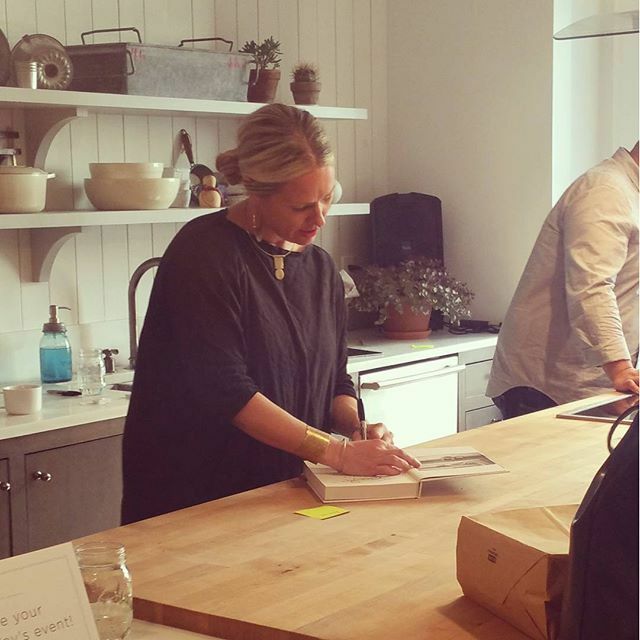 It was Yotam Ottolenghi and Heidi Swanson’s joint book signing—the first in our new office!—and there was no way to play it cool. Heidi swaggered in in an all-black ensemble with a smile that glowed (and not just because of her neon pink lipstick). Yotam entered with the chef of his restaurant Nopi, Ramael Scully—and, had he been the pope, might have received the same welcome. 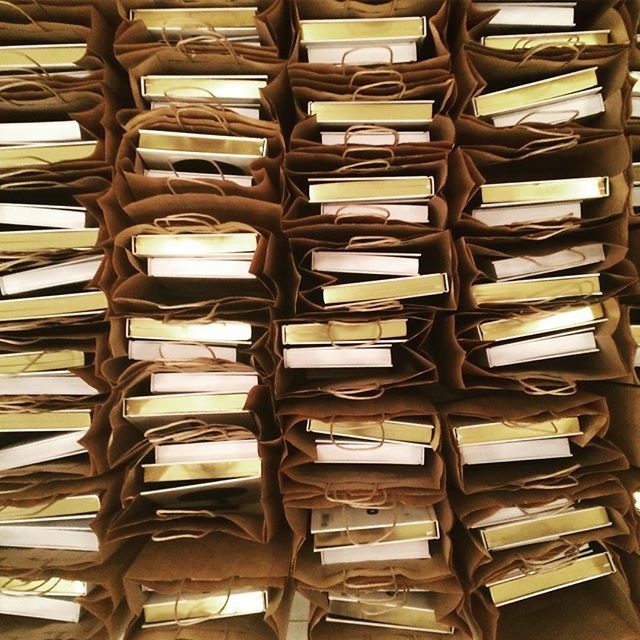 They’re celebrities in many of our editors’ eyes—but for reasons more heartfelt than lipstick and cologne. Their recipes are also admirable because, as we learned last week, you can cook them for 100 people in a home kitchen and not give up. (The key? Lots of helping hands.) Our test kitchen chef Josh Cohen planned a menu with recipes from Near and Far and Nopi that was cohesive and elegant: “Their approaches to food are very similar—take quality ingredients, make them taste like themselves,” he explained. I suppose there’s another reason why these people have changed the way we cook. Cauliflower can be cut down quickly (as opposed to, say, shelling beans). 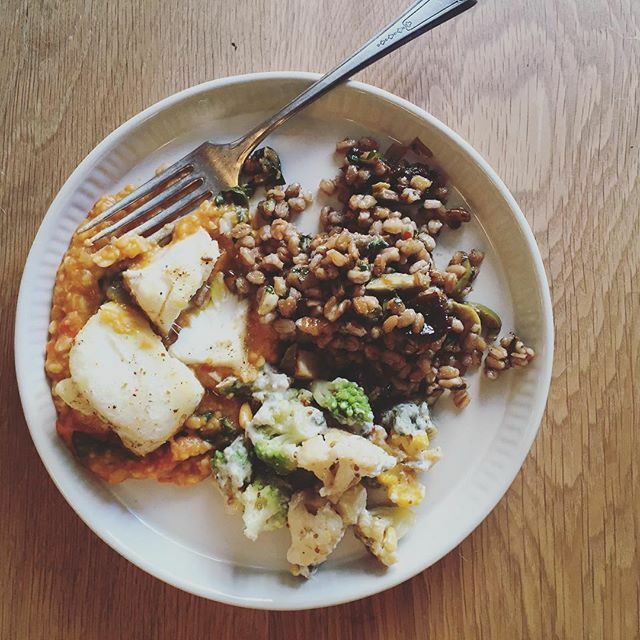 We used a mix of classic white, orange, purple, and Romanesco cauliflower. Josh always likes to serve come sort of crostini at a party—it’s popular, easy to eat, and scales up easily. This farro salad studded with green olives, walnuts, chives, and raisins could sit around for awhile, its strong flavors only getting stronger and therefore better. The cod could be marinated the day before and then just finished in the broiler the day of. And the dal had a striking color—lightly red from tomatoes—but with a rainbow of flavor: chiles, ginger, curry leaves, and yellow mustard seeds. I’d bet you’ll find more than one editor making this dal for lunch; it was a real standout. These cookies could be made the day before (likely more if pressed)—and while there is molasses, you wouldn’t know it: They are pure ginger in flavor. Similar to the ginger snaps, the cake was made in advance—and perfumes exclusively of almond paste. You can purchase Near and Far and Nopi here and here, respectively. Second image by Liz Andrew; Near and Far image by Rocky Luten; Nopi image courtesy of Ten Speed Press; all others by the editors. 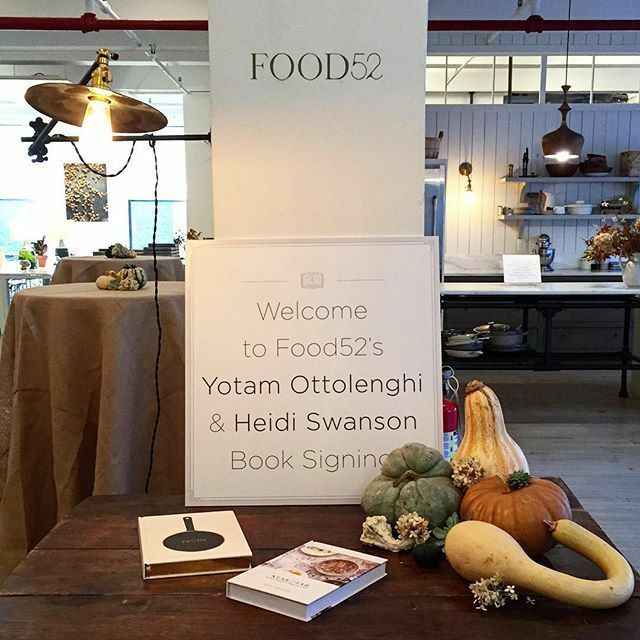 Tell us in the comments: How have Yotam and Heidi changed the way you cook? Heidi - your blog was one of the first food blogs (or blogs, really) that I started to reading a little over a decade ago. I still read it pretty religiously. One of the things I admire so much about you is the way you inspire home cooks like me to not only try new things, but take your recipes "in different directions" (to you use your frequent words!). Yotam - my husband and I ate at Nopi a couple of years ago when we were in London. I had no idea whether we needed a reservation, but I made one a month in advance of your trip because there was no way I was going to miss eating at one of your restaurants (it was one of our most delicious meals during our visit. You/Sam Tamimi/Rameal have changed the way I cook by bringing back comfort food to my world; food that doesn't stray far from its original form. I hope to make it to Jerusalem someday to experience some of this food prepared in the city/culture you draw from. When I read your recipes, they just make sense to me. The way you combine different vegetables/flavors/spices always makes me say, "of course! of course X and Y go together!" Thank you both (and Sam/Ramael/Wayne B) for bringing letting us into your worlds! 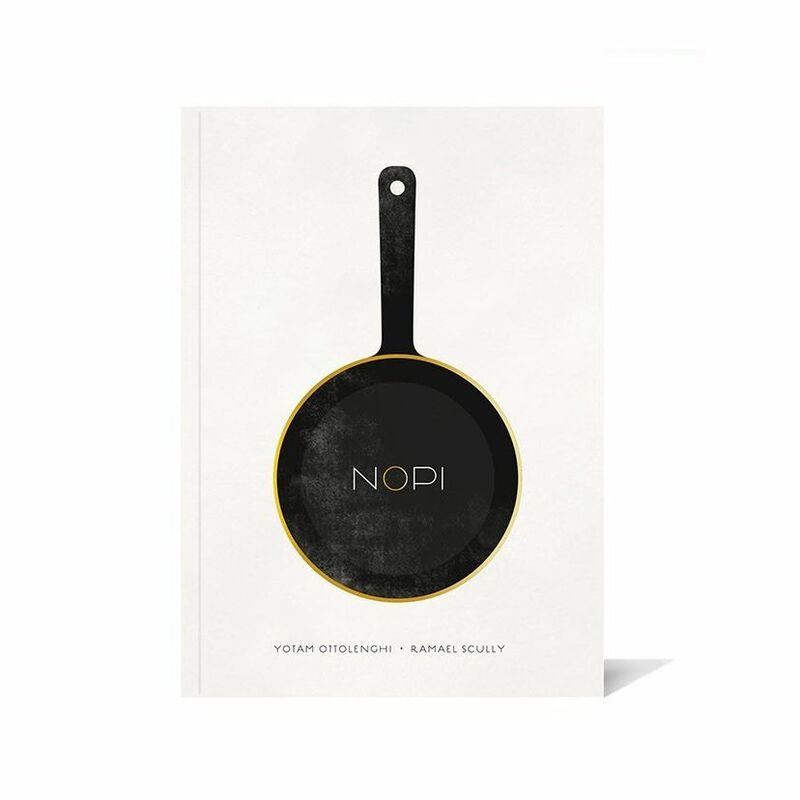 So, on the day and at the time you all were hosting Yotam and Heidi, I was in London, eating at Nopi, fulfilling a long-held dream and making good on a booking I had made a couple of months' prior - and several weeks before I got Food52's kind invitation to join you for the book-signing! Yotam is one of my cooking inspirations, so it was unbelievably ironic (in an unfortunate way) that during his week in NYC I was in London - and during his visit to Food52 I was at Nopi!! I confided the time-twist to the bartender and he couldn't have been more sympathetic...had a wonderful meal that exceeded my expectations. Sounds like his and Heidi's visit did that for all of you as well! Hope to see him in person another year, another time. Yesterday I was feeling not so great about food because we’ve been so busy and not eating at the super high level of nutritiousness that we often do, hahaha, so when I got this message it gave me the energy to pop put of bed and get us some good meals going and prepare for the week. It helps so much to get little words of encouragement, thank you mom! So glad you make delicious wholesome food a priority in your life! Just wonderful to see you take good care of yourselves. 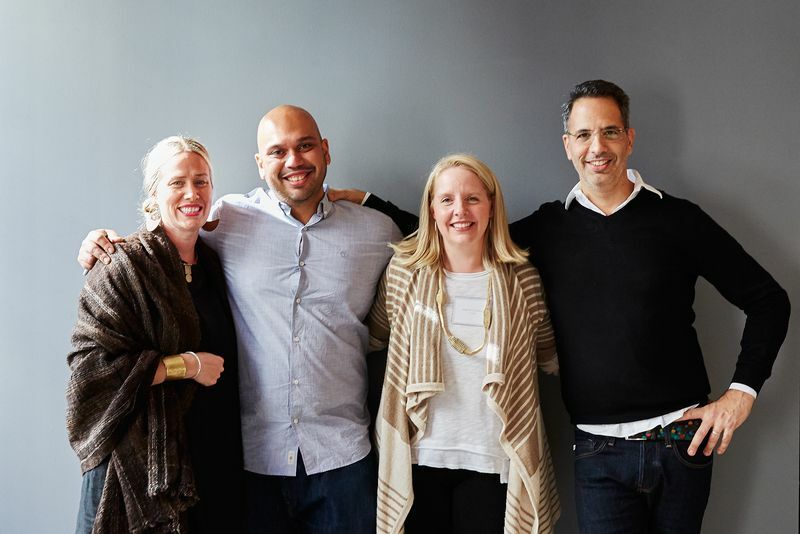 This email exchange with my daughter best explains why I love Heidi Swanson and Yotam Ottolenghi: they continue to inspire her and others to care deeply about themselves and each other. Heidi Swanson is solely responsible for my voracious cookbook/recipe appetite: before Facebook, (yeah, that was a thing) during my year abroad, how my friends and I stayed close was to read 101cookbooks.com and make things on our respective continents. The gigantic white beans with kale made me a kale eater. Already made the corn cakes and the roasted carrots from Nopi! I disagree. I'm a cooking enthusiast and I love collecting recipes. I spend a lot of time browsing UK & US sites and thus got to know Claudia Roden and Paula Wolfert via Chowhound's cookbook of the month archive. But to be honest, if I'm at a party in the Netherlands, Germany, France or Denmark (I’m a kitchenware buyer for a Dutch department store and therefore I travel a lot) and we're talking about food and favourite recipes , almost nobody knows these names. Whereas almost everybody has a favourite Ottolenghi or Jamie Oliver recipe. Yes Roden, Wolfert etc. are well known in the UK and the US, but it really was Ottolenghi who made middle eastern food mainstream worldwide. I think this reaction has to do with age and where you grew up. Those authors, Roden and Wolfert and others, were among ones my mom collected. As for introducing veggie and Middle Eastern cooking to the mainstream, growing up in San Francisco (and I'm sure many other cities on the West Coast), those things were just a part of what there was to eat. That's not to denigrate either of these authors, just to note that the statement was a bit limited in its scope. Maybe, say that this is true with the existence of the Internet, whereas once the spread of food styles was much slower and more localized. Timing is everything! This was pretty much my reaction as well – that this is a generational perspective, with internet attention the dominant measure importance (often, even of existence!) Authors like Wolfert or Roden predated all that, but their influence in introducing Middle Eastern cooking to a wide audience isn't a minor historical footnote - they were highly recognized. I'm sure Ottolenghi and Swanson themselves would be the first to give due credit. If only for context, at least a mention of those earlier authors would have added depth - and maybe even motivated a few younger cooks to look them up (on the internet!) and rediscover their work.